I mention very often that our main job is to free ourselves from the misery of neuroses such as anger, hatred, and jealousy. When you realize how difficult this is, and how much you suffer because of it, then it is important to switch your focus away from yourself alone and realize that everyone else has this problem. The people you share your home with, your parents, your co-workers, and everyone else you meet all have the same difficulties. It is vital to recognize this because the way out of your own misery is by caring for others. Rather than wondering, “How can I do something for myself?” think of others and what you can do for them. This is the bodhisattva’s way. Don’t withdraw into yourself under the pretense of meditation and saying mantras. On the outside you may look like a great spiritual practitioner but in reality this can simply be another cocoon to hide in while you keep thinking to yourself, “How can I develop?” or, “What can I do for me?” Instead, the moment you have difficulties and wish to be free of them, think of all the others who have these difficulties and also wish to be free. Then try to be helpful. Rather than making things more complicated and more confused by adding your own neuroses, which is a usual pattern for us, try to rely on whatever compassion you have, whatever wisdom you have, whatever caring mind you can get and then try to help. Begin with the people closest to you. They are all in the same boat. 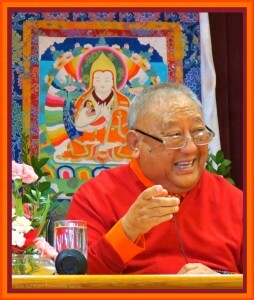 Think, “As much as I have this difficulty, they have the same difficulty.” Begin with one person at a time, rather than with all sentient beings. It has tremendous benefit, thinking of all sentient beings, no doubt. But it is a long shot to solve each and every person’s problems. And also when we are sitting on our cushion thinking of all sentient beings it is easy to imagine nameless faceless dots who do whatever we want, instead of real people who can really irritate us badly sometimes. So whatever we can do for those who are right in front of our own nose, try to help them. This is a way to keep your practice grounded. Even if it is only a small problem you will feel quite happy if you are able to help. This is the bodhisattva’s way of building happiness—by serving others.